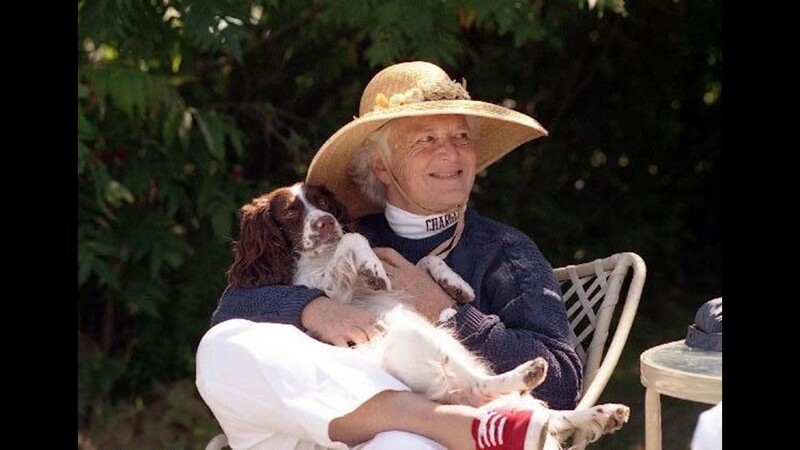 Mrs. Bush and Millie watch President Bush play tennis at Walker's Point, Kennebunkport, Maine in 1991. 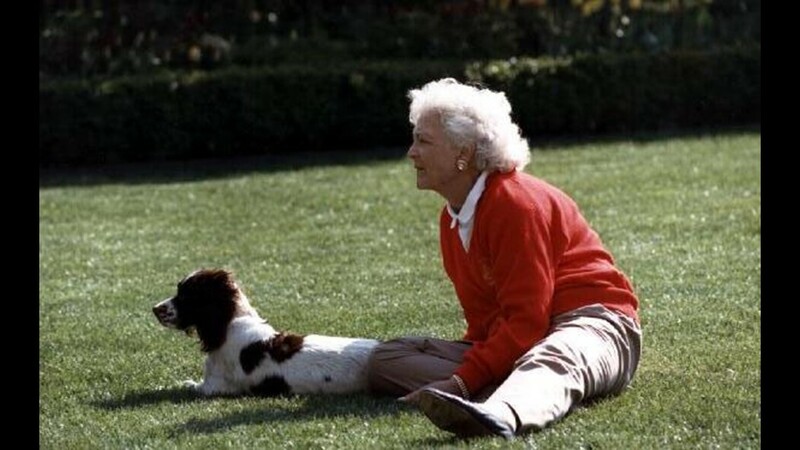 First Lady Barbara Bush with her dog, Millie, on the lawn of the White House in 1989. 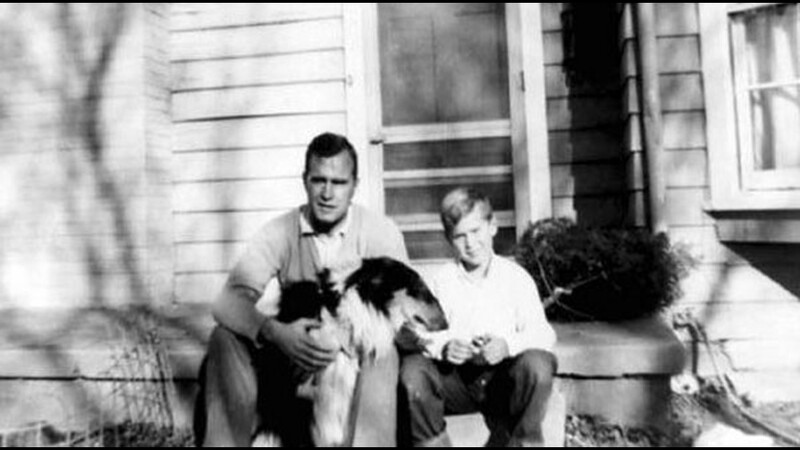 George H. and George W. Bush with their dog on the steps of their home in Midland in 1954. 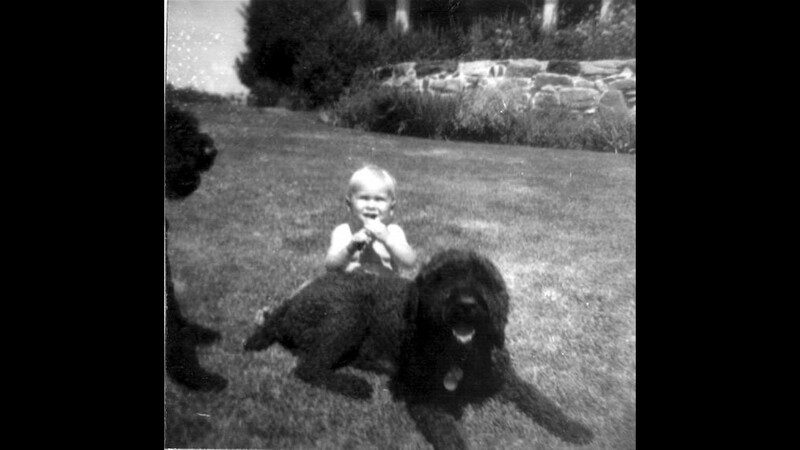 Baby George W. Bush plays with the dogs at Walker's Point, Kennebunkport, Maine in 1947. 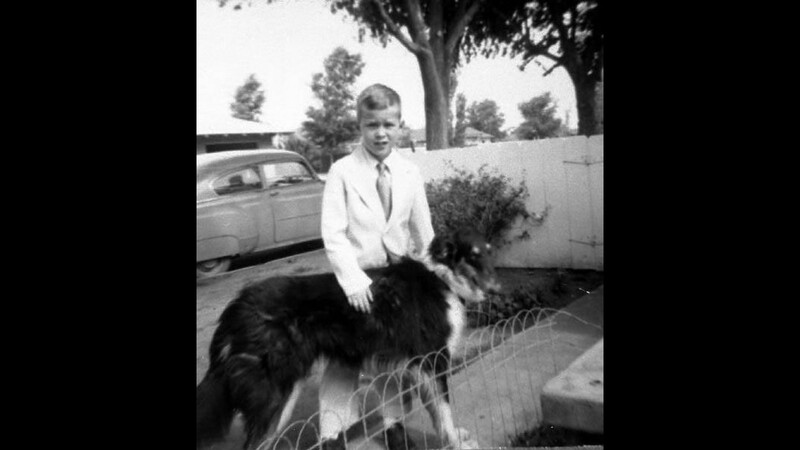 George W. Bush with his dog in Midland, Texas in 1954. 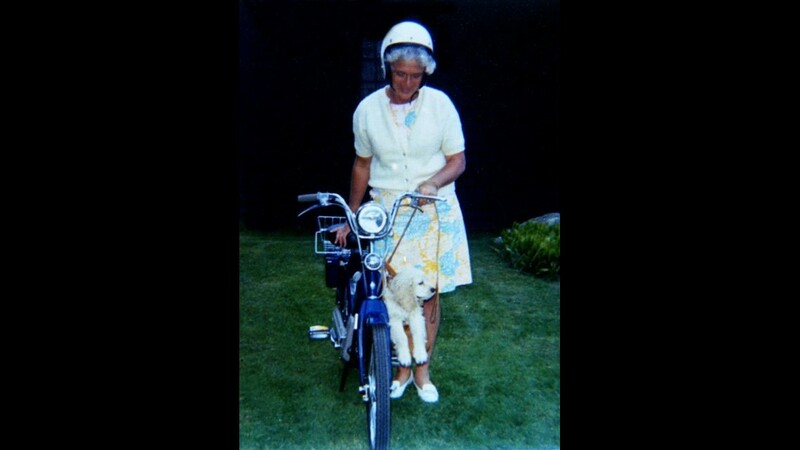 Barbara Bush prepares to go for a moped ride with her cocker spaniel, C. Fred, at Walkers Point, Kennebunkport, ME in August 1973. 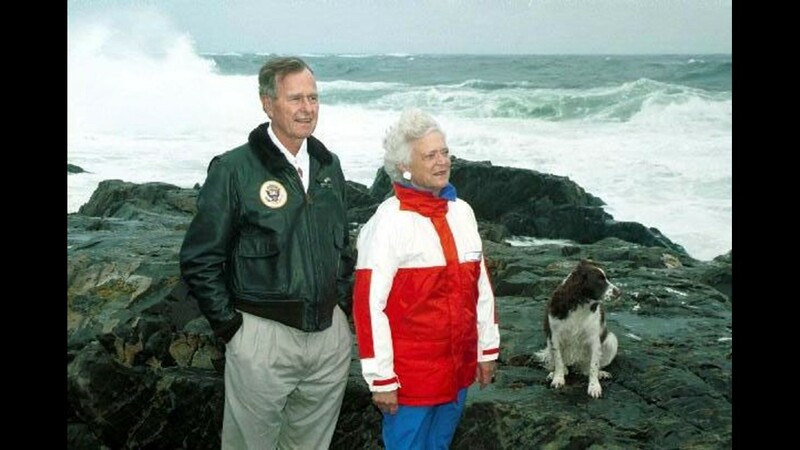 President and Mrs. Bush with Millie on the rocks at Walker's Point, Kennebunkport, Maine in 1989. 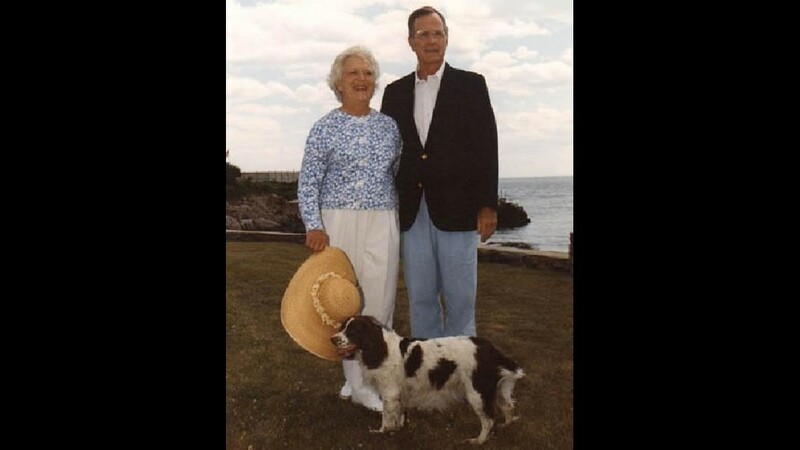 President and Mrs. Bush with Millie at Walker's Point, Kennebunkport, Maine in 1991. 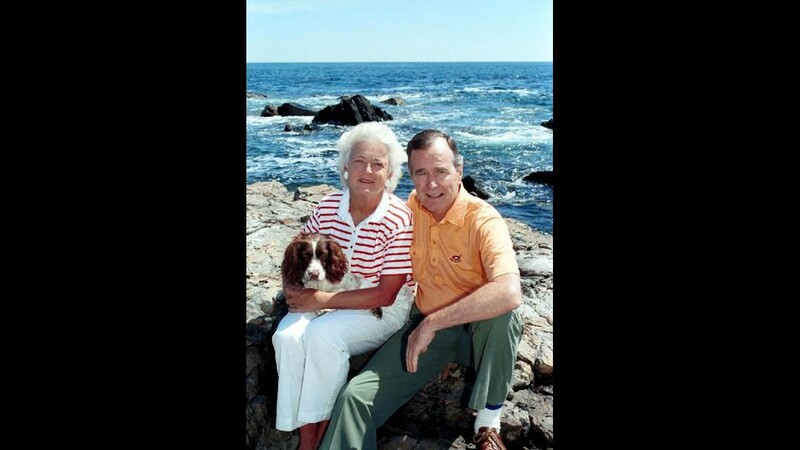 President and Mrs. Bush stand on the rocks with Millie outside their home at Walker's Point, Kennebunkport in 1991. 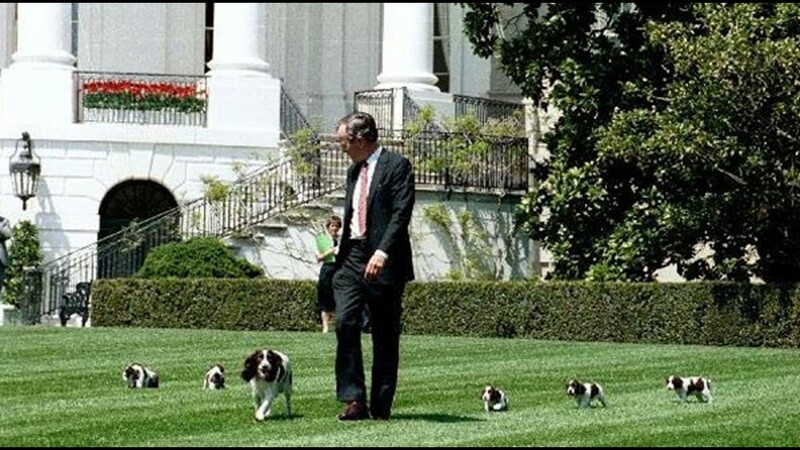 President Bush walks with Millie and her puppies on the White House lawn in 1989. 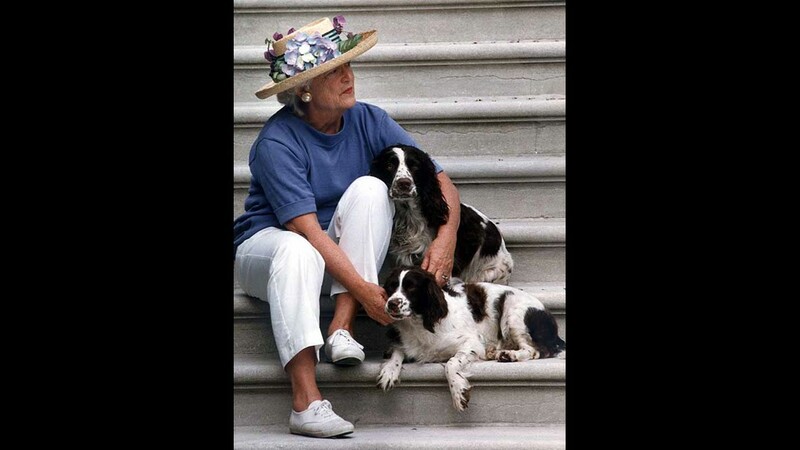 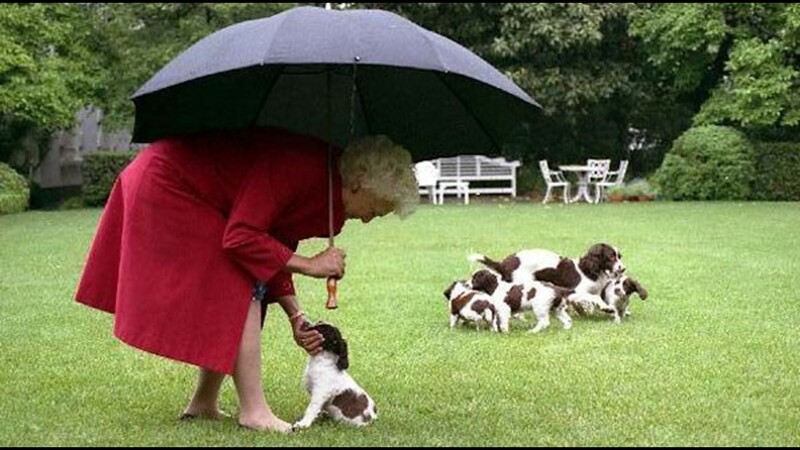 Mrs. Bush takes Millie's puppies out for a walk in the Rose Garden of the White House in 1989. 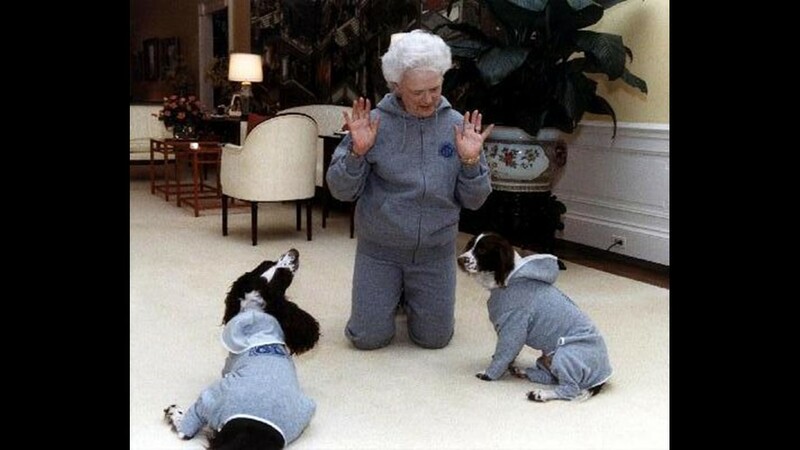 Mrs. Bush, Ranger, and Millie wear matching gray sweatsuits in the Residence of the White House in 1991. 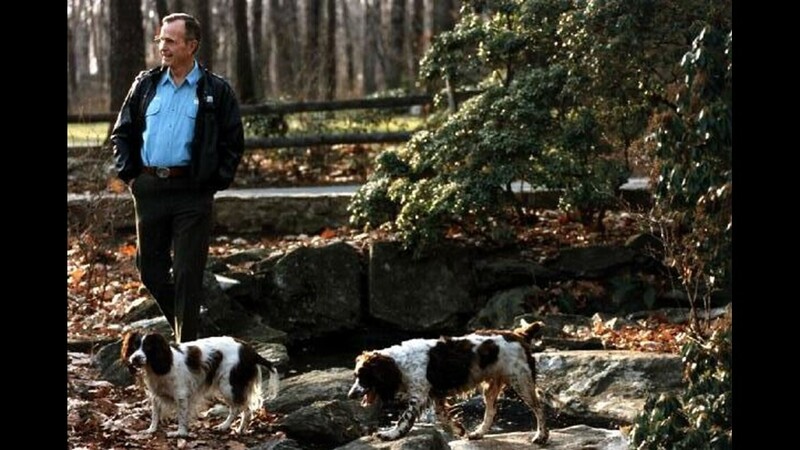 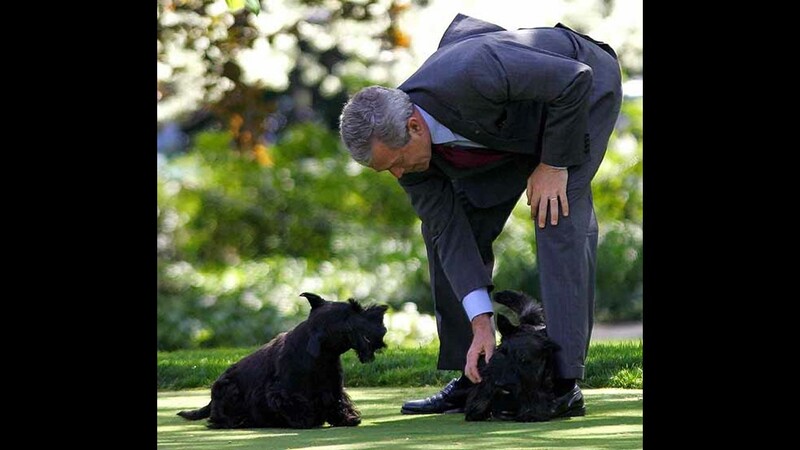 President Bush walking his dogs, Millie and Ranger, at Camp David in 1991. 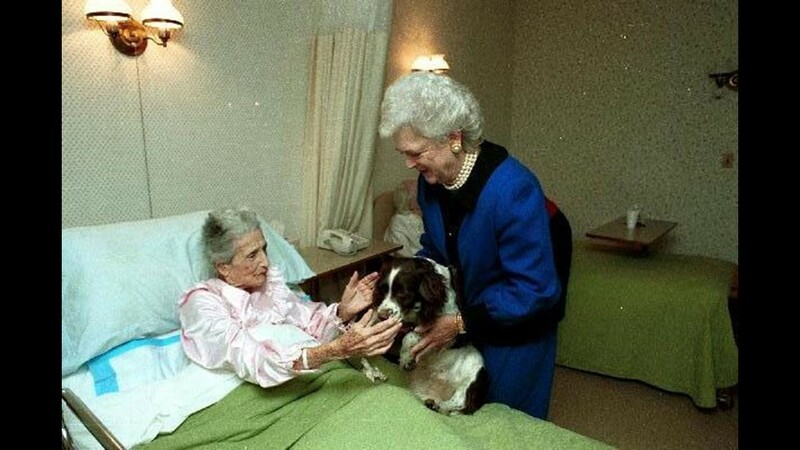 Barbara Bush and Millie visit residents of the Bethesda Retirement and Nursing Center, Chevy Chase, Maryland in 1990. 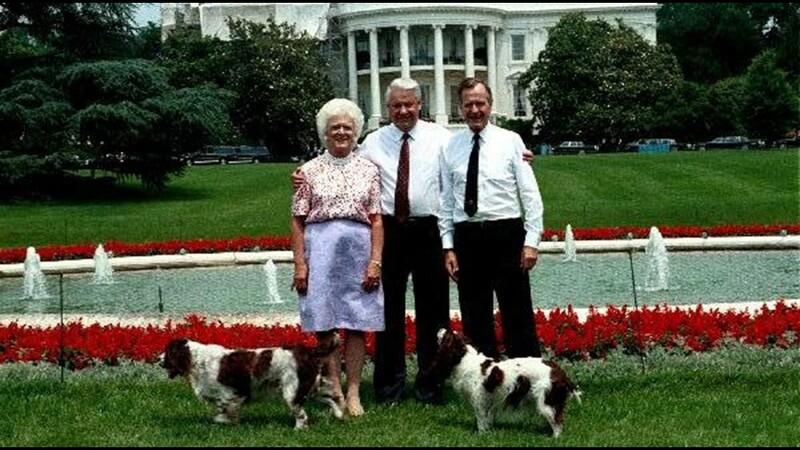 Russian President Boris Yeltsin poses on the South Lawn of the White House with President and Mrs. Bush and their dogs, Millie and Ranger in 1992. 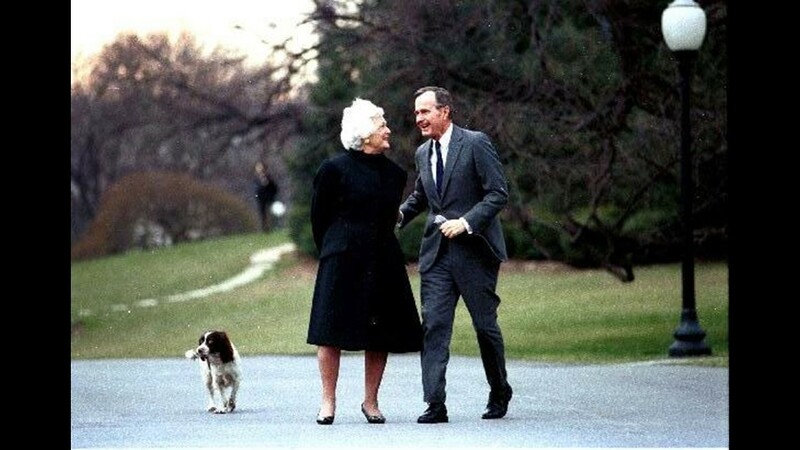 President and Mrs. Bush walk with Millie. 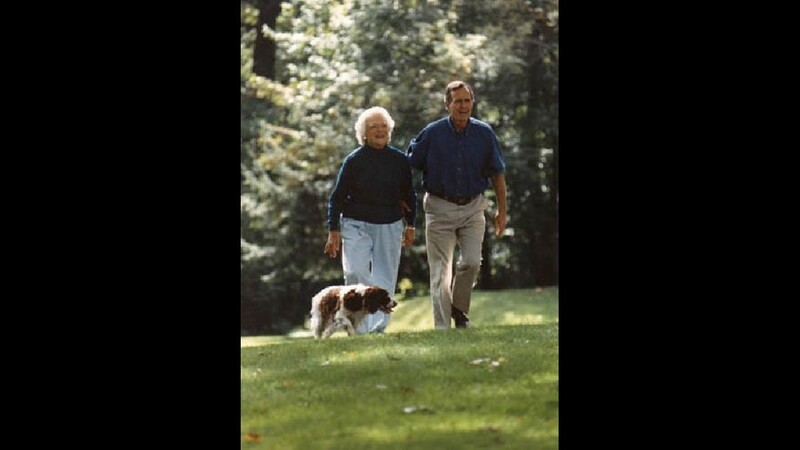 President and Mrs Bush walk with Millie at Camp David in 1992. 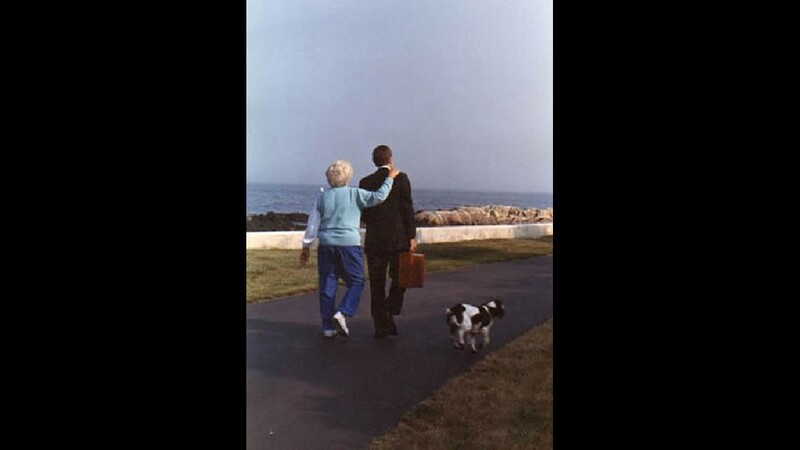 President and Mrs. Bush walk down their driveway with Millie at Walker's Point, Kennebunkport, Maine in 1989. 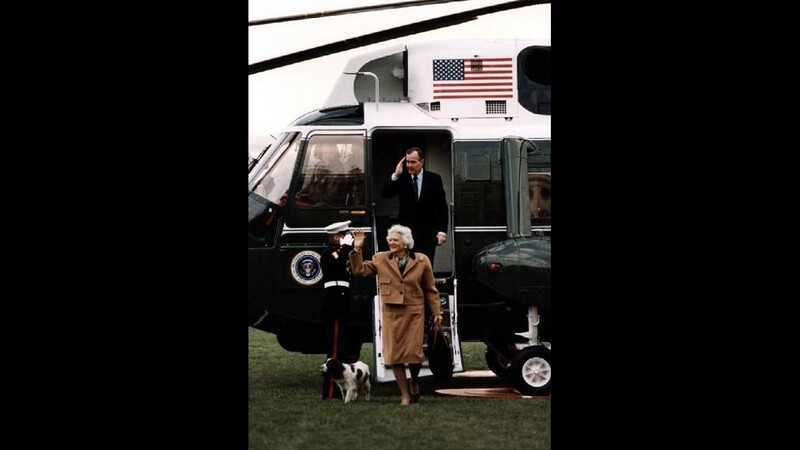 President Bush, Mrs. Bush, and Millie leave Marine One in 1989. 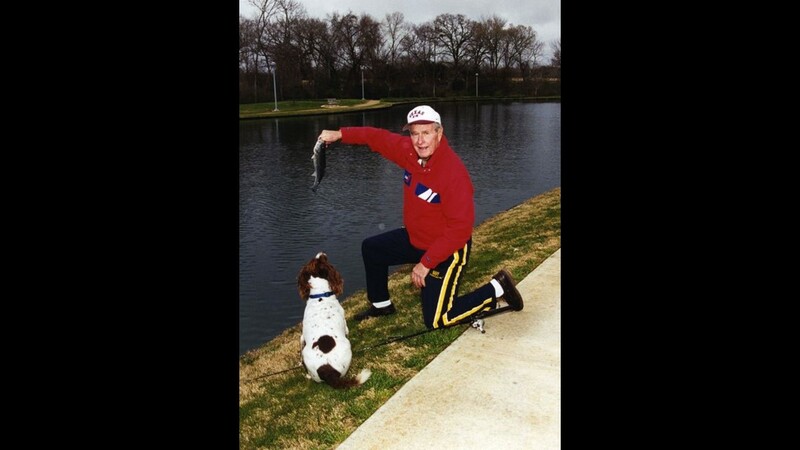 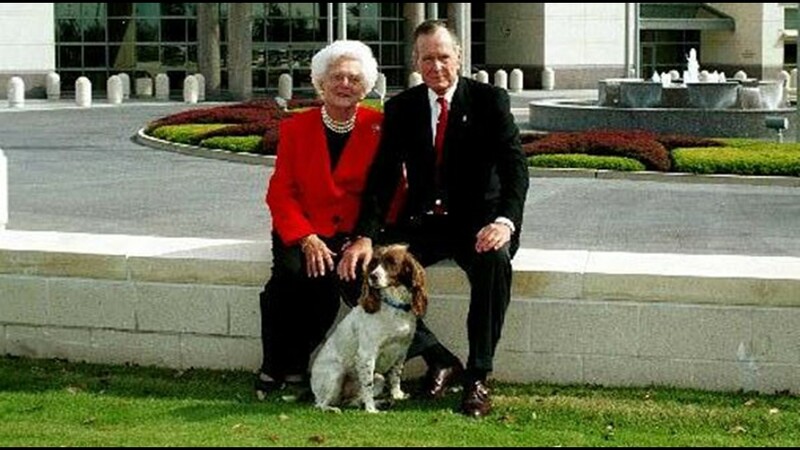 Former President and Mrs. Bush pose in front of the Library for their 2002 Christmas card photo with their dog, Sadie. 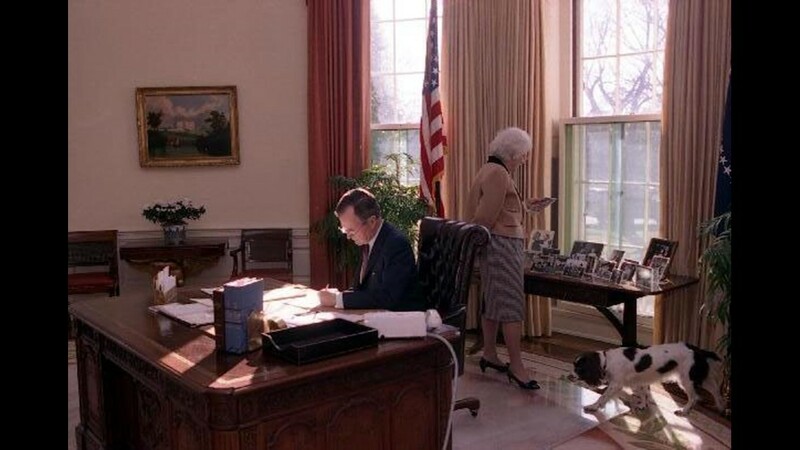 Mrs. Bush examines family photographs and Millie paces the floor as President Bush works at his desk in the Oval Office in 1989. 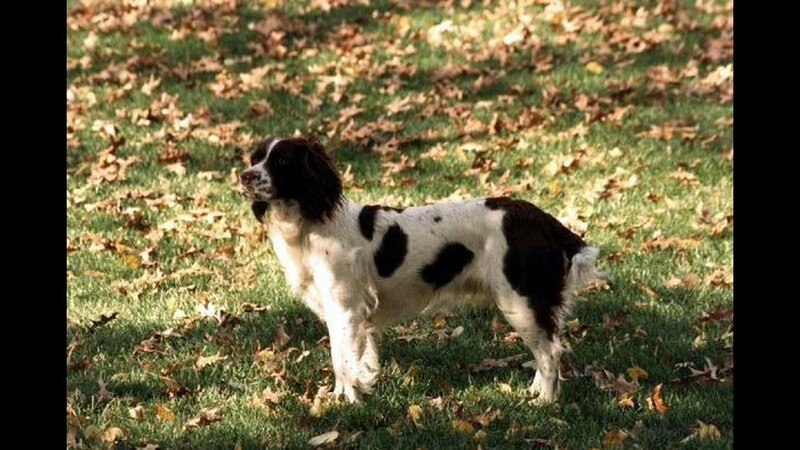 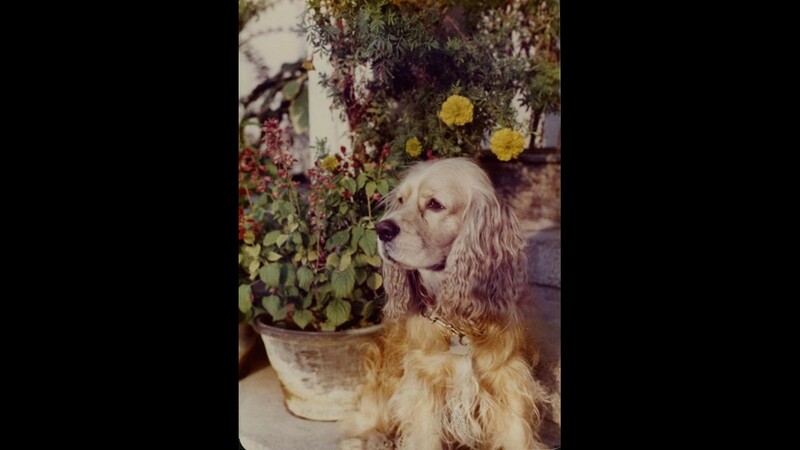 Millie stands in the leaves on the South Lawn of the White House in 1989. 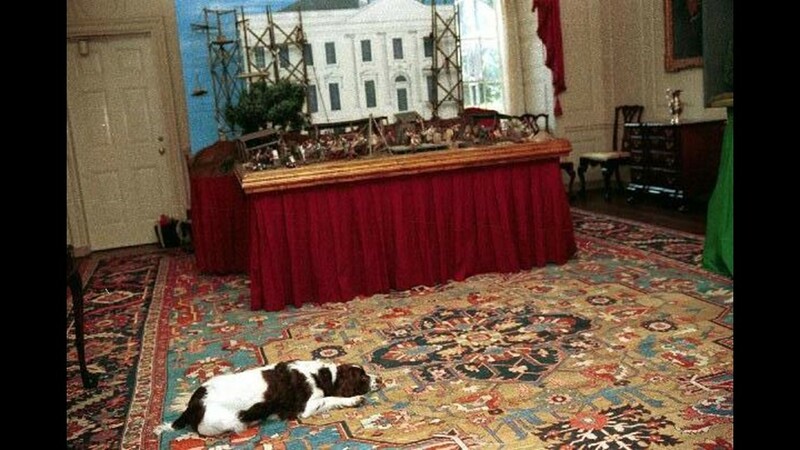 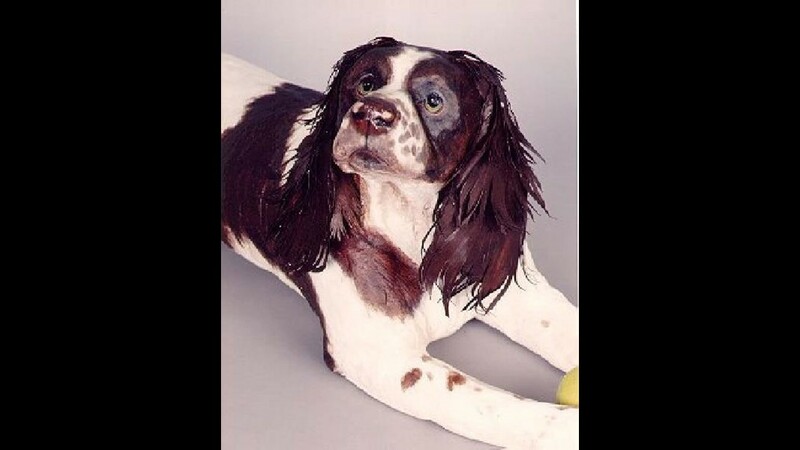 Millie rests on the floor of the Map Room in front of a model of the construction of the White House in 1991. 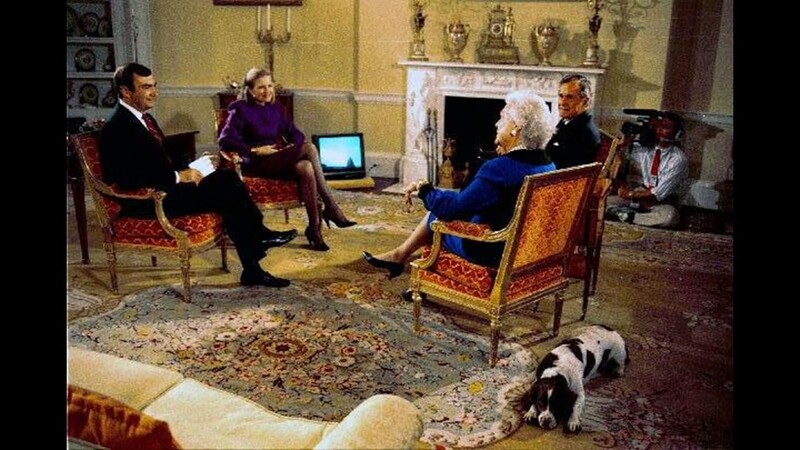 President and Mrs. Bush are interviewed in the Yellow Oval Room of the White House by Sam Donaldson and Diane Sawyer for Prime Time Live in 1989. 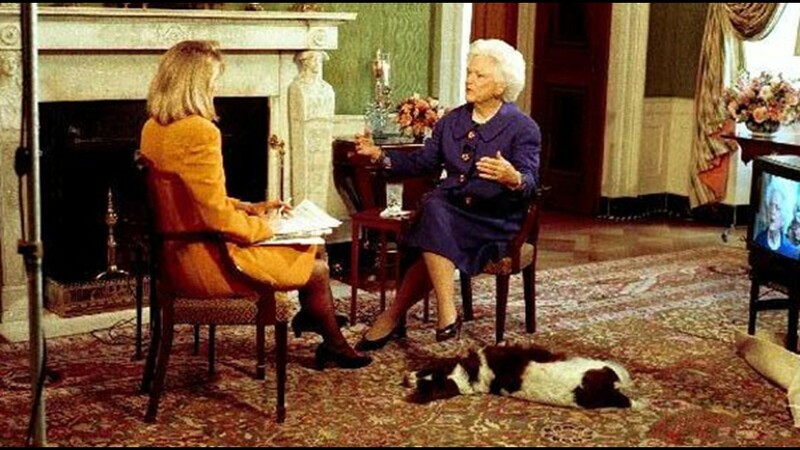 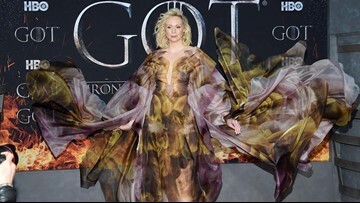 Millie waits quietly in the background. 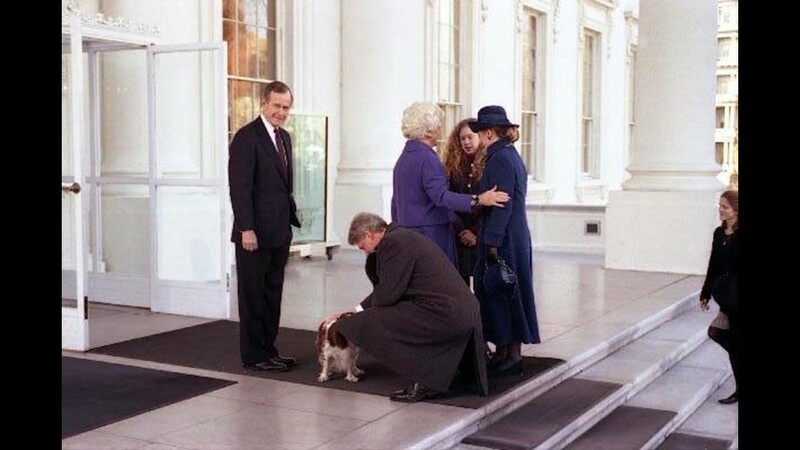 President and Mrs. Bush greet President-elect and Mrs. Clinton and their daughter Chelsea upon their arrival at the White House before they drive to the Capitol for the Inauguration in 1993. 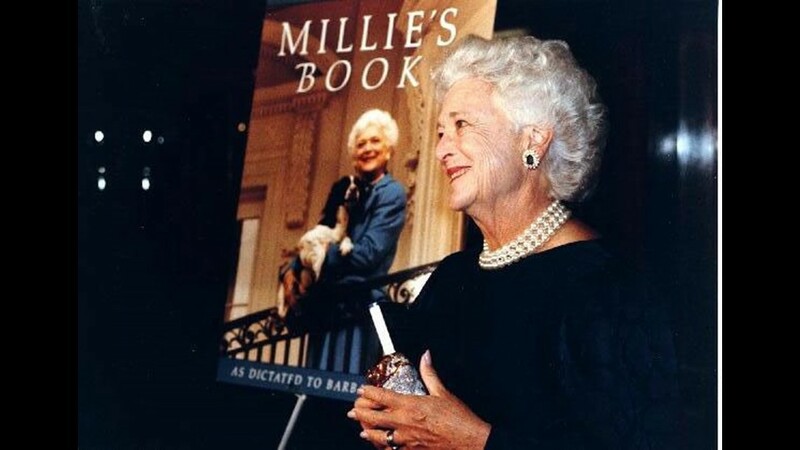 Mrs. Bush at the 1990 opening celebration for Millie's Book. 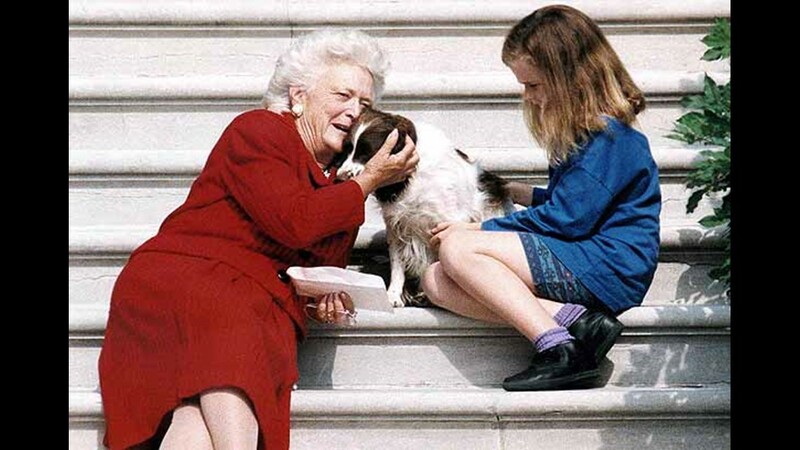 Mrs. Bush carries a handbag of Millie's likeness especially designed for the occasion by Judith Leiber.